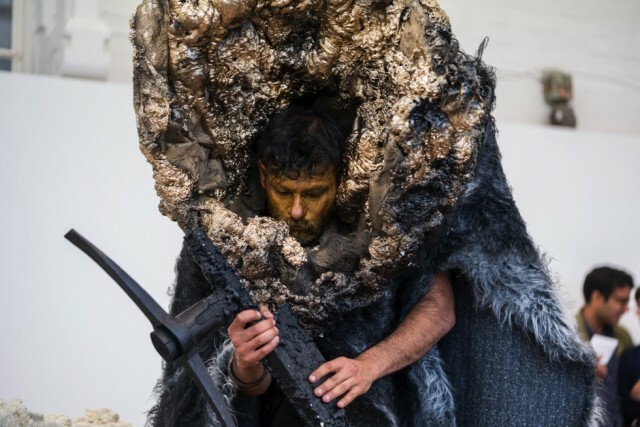 Sahej Rahal was born and lives in Mumbai, India, and since graduating from Rachana Sansad Academy of Fine Arts and Crafts in 2011, has made installations, films and performances where each element functions within an elaborate and still-evolving mythology. 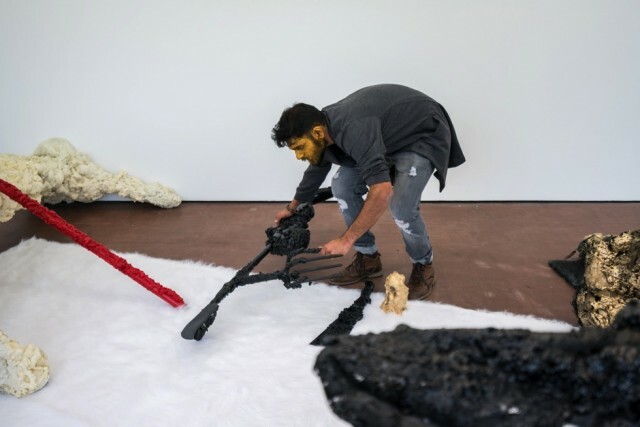 A Liverpool Biennial 2016 artist, Rahal was recently commissioned to undertake a residency at Primary, Nottingham, as part of Reimagine India: a cultural exchange programme marking the 70th anniversary of India’s independence, culminating in an exhibition entitled Dry Salvages. His residency also launches Primary’s own Here, There and Everywhere: a series of artistic collaborations between India and the UK. Rahal will continue to develop the work made at Primary at venues through 2017, culminating with an exhibition at mac, Birmingham, in 2018. The Double Negative: I wondered if you could talk a little about the approach you’ve taken in making Dry Salvages? Sahej Rahal: There is a growing meta-narrative in my work which is added to with each piece I make, so there is always a starting point in other things I’ve made. Every object or performance becomes another fragment in that larger narrative, expands that story or develops it in a different direction. The objects are made from found materials, things I find in and around the spaces where I work, and their forms develop through a negotiation where I work out what the materials represent and begin to tease their characters out of them. But these objects and materials are never as they seem – they are always pretending to be something other than they actually are. This is where the foam-covered pieces come into the environments, which in Dry Salvages looks like a catwalk runway or suggests a time-line of some kind. That will become important when the space is activated during my performance, when I introduce the character who will meander through it all, dressed in a costume that also morphs and changes and resists taking a fixed form: it is a cloak, then a kind of hood. It can become animal or alien at different points. Everything in this work is held in the process of becoming. Everything is a bit makeshift. Everything is also part of that larger meta-narrative. I’m always really just asking people to step into my work at one very particular point in its larger evolution and find their own interpretations and meanings in it as it unfolds. You’ve mentioned particular films and other influences in conversation during your time at Primary. Are there any specific connections of that kind that are important here? Not really, except in the sense that there are obviously influences that have come from the materials I’ve collected, and some of the materials have suggested slightly absurd ideas, which might have come to me from films and writing, but might also have come from nowhere in particular. I’m happier leaving those kinds of connections and allusions undefined because that allows me to expand and push the narrative away from any singular thread it might have been tied down by. The process is often about throwing something into the fray – but then trying to dodge it. 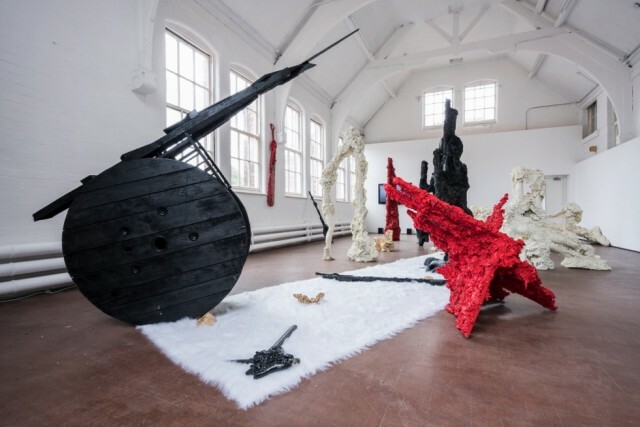 Maybe there is one exception, in that I did have Alejandro Jodorowsky’s The Holy Mountain  in my head while making some of the sculptural objects, so their strong colours – the reds, blacks, whites and gold – probably relate to that. But that’s more as a visual than a meaning-based inflection in the work, and came about more because Jodorowsky’s visuals were suggested by the things I was already making, rather than because those things were referencing him in any more conscious or direct way. In terms of the residency itself, has being in Nottingham influenced this work? Yes, of course, in the sense that all the physical materials I’ve used were all sourced as found materials here, and the materials carry something of their character and history with them. And I’ve been writing a lot of stuff while I’ve been working here that might not have directly affected this particular stage of the project, but may come into the foreground during the next leg of the show, when I go off to do a residency in Scotland [the Cove Park/Henry Moore Fellowship from 6 July]. So many of the things I’ve learned and thought about at Primary will probably manifest themselves in the next space I go to, and the things I learn there will inform what I do in the space after that. I think a small visual reference to walks I’ve taken in the Peak District during my time here will crop up in the film I’m making, but that’s all that has surfaced in the work so far. When you talk about that meta-narrative, is this something you see as fairly self-contained? In your films the characters you play are often a presence around whom things happen. They might have emerged from outer space, from myth or folklore, but their purpose seems to be to catalyse certain responses in those who see and interact with them. That’s true, in the sense that my characters do seem to emerge from spaces outside the real world, or our world, and populate the narrative and become pivots for the story to turn around. 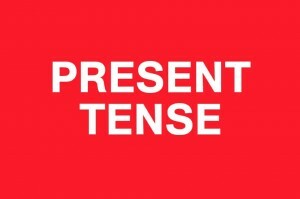 At Primary, the video piece that will be part of the installation is put together within an idiom where various different things are spliced together without too much explanation. It has a narrative about a DJ who can scare away ghosts and spirits, and there are recordings of this DJ, extracts of the music he plays, but that is not a complete narrative, and is spliced together with something else entirely. 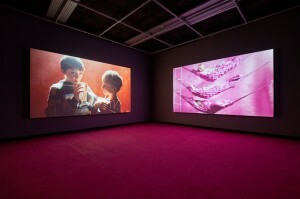 The video narrative is also at a tangent to the work in the space itself. But on another level, it opens that story up and adds other layers and ideas to it in a slightly oblique way. To that extent, the narrative always exists, but it is never linear or clear, and it’s for people to piece together as they wish. In folklore, there is an old idea of banging drums or singing to frighten away spirits, so that idea of a musical exorcism does seem to have a mythical or folkloric presence – are there versions of this from Mumbai or elsewhere that you’re referencing? There are mythic references, but not quite in the way you’re describing. That idea of the shaman is obviously not an Indian concept, but there is a certain role that the concept of the shaman describes that seems universal and interests me very much. You know that figure of the outsider, who is an omniscient healer of society, or who at least tries to take on that role? This, for me, is a very troubling masculine archetype, and it is especially troubling in the current geopolitical context where it slips easily into a kind of messiah complex. You see these political figures who appeal to that archetype, that idea of being “the saviour of the nation and the people”. They are people like Narendra Modi or Donald Trump, who push this idea of themselves as outsiders coming in to put right a sick society, just like these archetypal shaman figures. When I go home, there are the yogis, too, and again they present themselves as outsider figures with constituencies for their hard-line politics. There is the constant misdirection that goes with that. So my own narrative is about creating a lot of fragments, and these, in my own head, are all part of some twisted version of the real world – a kind of alternate version of these real events that is shaped from all the detritus. What you say about that archetype is interesting, because the artist is often seen or presented as that kind of outsider. There is the troubling aspect of that archetype, but also the way that you are also operating through the rituals of making art. Yes, that’s true. Maybe I’m projecting my own messiah complex by making this work, who can tell? 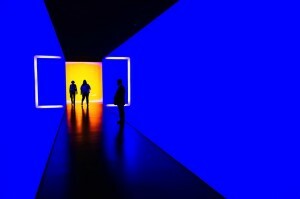 And there is a certain kind of very didactic artist who operates in that same messianic way and believes their practice is floating up above the world and operates on some higher plane of knowledge – a complete aesthetic understanding of the world. These are the ideas I’m interested in messing around with. The present day, and my characters as they encounter it, simply offer a jumping-off point, a bridge into an alternate or potential reality that others can choose to cross or not, as they please. There are no responses to the work that are more or less correct, just many layers of possible meaning. Is this meta-narrative, this alternate reality, something cohesive and structured, with its own rules, or something loosely improvised that is reinvented as you go along? There is a fairly coherent sense, for me, of how the narrative is shaped, so without getting into my own interpretation of the history and cosmology around it all, there is a time-line, and one work or stage in the larger narrative always flows into the next in a fairly organic way. There’s something in this that reminds me of the cosmology that [musician and artist] Sun Ra built around his body of work: a sense that the various forms the work takes all exist in some wider universe of related ideas. The structure is always there, but for me, the whole idea is that whenever I feel this structure is becoming restrictive I try to step back from that point and push it in a new direction. Before I came to Nottingham, I was working on a text for The Book of Nations, which is an imaginary, mythical book, a bit like the Necronomicon in HP Lovecraft’s stories. I was writing this text as a series of fragments, but as I went on with them it seemed they were becoming quite prescriptive, forcing one reading onto the work to the exclusion of others. At that point I needed to rethink my approach because these works should always be like toys that people can pick up and play with, not the parts of a puzzle that has correct answers and solutions. Certain forms here do evoke something visceral, or part-human, part non-human, so perhaps this is a good moment to ask about the writings of HP Lovecraft? I’m interested in HP Lovecraft precisely because he is such a troubling figure. He writes deliciously horrific stories, but he himself is immensely problematic. So the whole point of entering a conversation with Lovecraft, for me, is partly to explore those stranger ways of navigating ideas of identity he opens up, but also contest his ideas of Otherness. Lovecraft shows us this horrific idea of Otherness, which strongly relates to his own prejudices and fears. And if I put my cards properly on the table, the fact is that I’m a brown person, and that means Lovecraft would have seen me as The Other, too. So I’m interested in taking his idea of The Other and manifesting it as a very slightly horrific, but mostly benign presence, bumbling through the space. It’s about taking those imposed narratives, which Lovecraft exemplifies, and which form the threads of so many problematic ideas in our own time, and making toys out of them so that all of us can play around with them in a communal and collective way to make new meanings for ourselves. I want to create a space that is filled with affect: not by making the audience Other to myself, or myself Other to the audience, but instead breaking down that distinction at a more fundamental level. There is no Other. They contain a lot of contradictions. The colour scheme is strong, with lots of gold and red and black, but despite appearances those primary colours are never truly solid, they are inflected with other colours and never pure. And you notice that the sculptural forms are often phallic, with all the vertical protrusions implying a weight and monumentality like heroic modernist sculpture. But they’re also light and unstable. They could simply topple over at any moment. Some of these structures also engulf the bodies and limbs of mannequins. Or are those female forms emerging from them? Perhaps I was playing with this from the perspective of a male artist, with all the conventions of gender that reinforce that. These sculptural forms are always as absurd and contradictory as I could make them. They aren’t resolved as singular forms and they retain the appearances of the fragments from which they were made, but always in a state of potential change. These same materials can, and will, take other forms. The costume I wear will play on that idea of mutation, too, because its form can change dramatically depending on how it’s worn during the performance – with the hood raised or lowered, the cloak wrapped around me or opened out. And because I have HP Lovecraft on my mind, there is a strong sense of the performance being geared towards a space where the whole idea of what a body is can shift and change from one moment to the next. Any sense of a singular identity, for anything here, should be hard to pin down! Do you see there ever being an end-point to this narrative you’re creating? I don’t know. In some ways I’m constantly trying to create false endings for it, points where it can cross from being one thing into another, or start to become a different kind of narrative altogether. But that’s a way of dismantling it, or changing the shape the narrative is taking so it moves in a new direction, rather than concluding or resolving it. I don’t know if I ever think about it in terms of an actual ending, and I’m probably still having too much fun with it to think about stopping it for a while yet, at least. But it’s a hard question – perhaps there will be a point where it ends, or perhaps that point will never come and it will keep changing and evolving as it goes along. In that sense there is always the possibility that it could end even if I don’t see that point ever arriving.